Prepare to go to pie heaven. 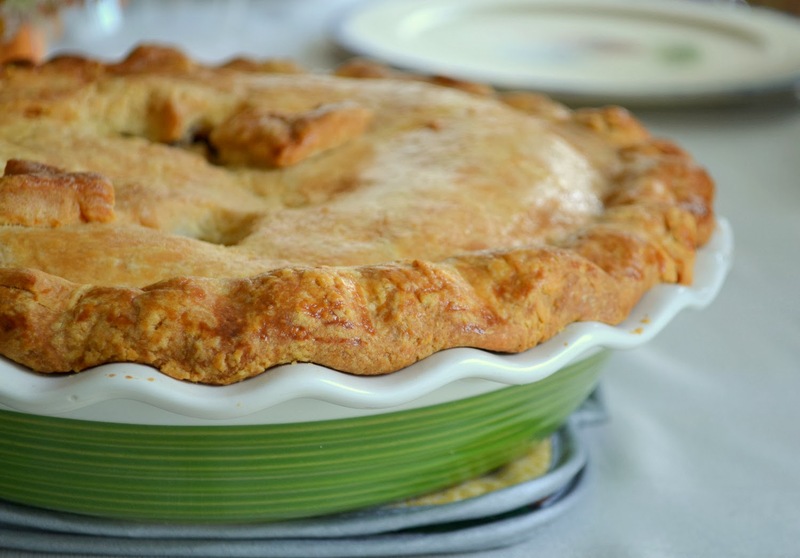 I'm usually not one to mess with tradition (though oddly enough, our family favorite basic apple pie recipe still isn't on the blog), but this pie needs to have a place at your Thanksgiving feast. It is a bit time consuming, but so totally worth it. Volunteer to bring the pie, if you aren't hosting this year, and wow your friends and family. If you are hosting, farm this recipe out to a reliable relative. This pie is slow cooked and bursting with flavor. The apples get pre-caramelized then doused with rum, butter, and brown sugar. I'm telling you... it is good. Thanks again for the cookbook, Crystal! If you need any other Thanksgiving recipe ideas, all of the K&K recipes are tagged with Thanksgiving. We have pie recipes, the best turkey ever, and your side dishes (except for mashed potatoes) covered! Put the flours, sugar, and salt in the bowl of a food processor and pulse a few times to combine. Add the cold butter and shortening to the dry ingredients. Use your hands to break up the shortening into several smaller clumps and get them coated with flour. Pulse 9 to 12 times or until the butter is in pieces slightly smaller than a pea. Combine the ice-cold water and vinegar in a small bowl or measuring cup. Gradually pour the water and vinegar mixture through the feed tube while pulsing 10 to 12 times. Take the lid off. Use your fingers to see if you can clump the mixture together to form a dough. The dough should not come together to form a ball while you are pulsing it in the food processor, but should form a clump between your fingers.) Use a spatula to scrape the sides of the food processor. If the dough seems too dry, add more water a few teaspoons at a time. Remove the dough from the food processor, form it into 2 discs - one slightly larger than the other, wrap and chill for at least 2 hours before rolling it out for the pie crust. Add the apples, dividing them between the pans, and saute until they are about half cooked and the juices released boil away so that no liquid remains (8-10 minutes). Toss and stir the apples regularly while they are cooking so they cook evenly on both sides. When the apples are done, they should have some give, but should not fall apart. Roll out your pastry between lightly floured wax or parchment paper until it is about 12-inches in diameter and about 1/8 inch thick. Peel off the top layer of paper. Fold the pastry circle into quarters, and transfer it to a 9-inch pie plate, unfolding gently and lightly pressing the dough down and into the sides of the pan. Trim the excess dough so that there is a 3/4 inch to 1 inch overhang. Roll the second (smaller) piece of pastry into an 11-inch circle. Put the apple pie filling into the pastry lined pie plate. Transfer the smaller pastry circle to the top of the pie (you can pre-cut some shapes into the top for ventilation and then later attach them with starch water). Roll the bottom crust overhang up over the top crust, and seal the edges together. Use your finger or the handle of a butter knife to crimp the edges together. Brush the top of the crust and the edges with heavy cream and sprinkle with granulated sugar. 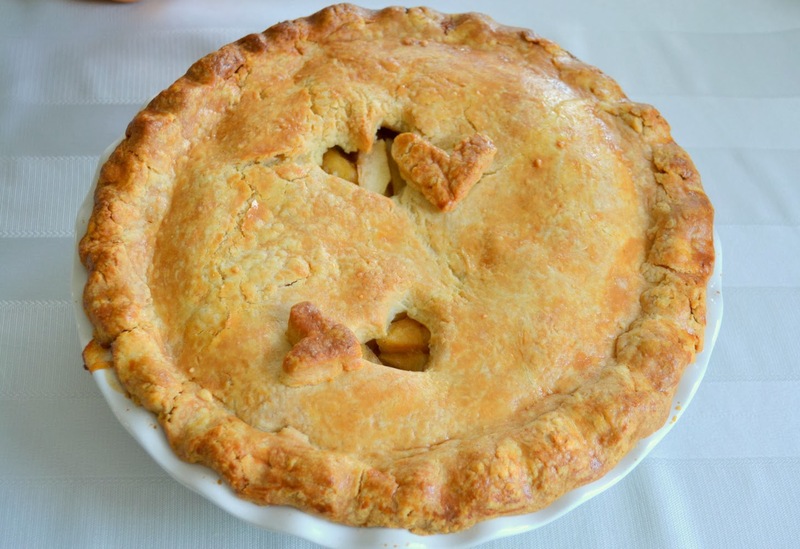 Put the pie on a baking sheet to catch any drips, place in the oven, and bake for 30 minutes. Tent the pie with foil and continue to bake for 1 hour. Remove the foil and bake for 30 minutes or until the pie is golden brown. (Total baking time is 2 hours.) Remove the pie from the oven and cool for at least an hour before serving. This looks so good! I think I'll make this for either Thanksgiving or Christmas dinner...maybe both!